Suzanna Martinez will study how sleep duration affects the diet and physical activity of Mexican-American children. September is Childhood Obesity Awareness Month and Hispanic Heritage Month kicked off on Sept. 15. A new Nutrition Policy Institute study on obesity among Mexican-American children ties in with both of these themes. 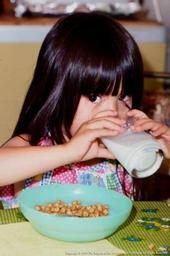 Childcare providers must serve only fat-free or low-fat unsweetened, plain milk for kids two years or older. Obesity among preschoolers is a serious health problem, with one in four obese or overweight by the time the child is ready for kindergarten. Given that well over half of preschool age children are in childcare, UC ANR Nutrition Policy Institute researchers decided to investigate whether healthy beverage standards in childcare could improve their nutrition. Another reason to focus on this age group is that young children are still developing their eating habits. Those who get an early start at eating a nutritious diet will likely have better health outcomes than children who get in the habit of eating junk food and drinking sugary beverages. Watch the video "We're Not Buying It" at the end of this post. Pulitzer Prize winning journalist Michael Moss is best known for coining the term “pink slime,” a reference to a meat additive that, thanks to Moss’s reporting, had a particularly bad PR day in 2009, when his high gross-out factor exposé was published in the New York Times. Products containing the cringe-inducing substance were subsequently banished from many grocery stores and schools.